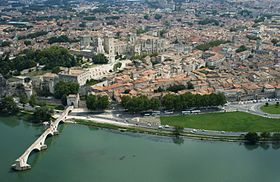 In Avignon, a little further south, place de l’Horloge is the centre of town life, with its cafés, Théâtre Municipal and 19th-century Hôtel de Ville. The square gets its name from the Gothic clock tower, Tour du Jacquemart. To get a feel for the city’s attractions, walk around rue des Lices and rue Joseph Vernet, a parade of posh shops in 17th- and 18th-century hôtels particuliers. Take in the collection of Impressionist paintings in the Fondation Angladon-Dubrujeaud, and the Collection Lambert ) of conceptual modern art, as well as the Musée Calvet , with its fine art collection presented in a beautifully restored 18th-century palace.